County Tipperary (from the Irish, Contae Thiobraid Árann), divided into two regions of government in 1898, is held together by the River Suir at a length of 115 miles. 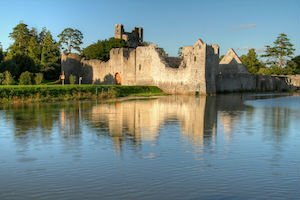 Tipperary Heritage Way, a National Waymarked Trail, leads along 35 miles of the river, through ancient roads and several historical sites. The county as a whole is famous for the Golden Vale, a 14 mile stretch of peerless pastureland, and as the birthplace of Brian Boru, who for a brief period of time during the 10th century was the undisputed King of a rarefied united Ireland. Perhaps the country’s greatest Celtic warrior, he removed the Viking leadership from their seat of power. Apart from Lough Derg, the second largest lake in the Republic at over 45 square miles, the north of the country is rather undistinguished. The south, however, belongs to the Galtee Mountains (the highest in Ireland), which are most picturesque as viewed from the Glen of Aherlow. The legendary Irish poet, historian and priest Geoffrey Keating, is supposed to have preached from a cave at the foot of the mountain. The extraordinary Rock of Cashel, incorporating Cormac’s Chapel, round tower and high cross, is the result of ancient volcanic and tectonic activity, and limestone rocks splinter and disform the land. Of course, local mythology takes precedent in Irish culture and the rock is said to have split from Devil’s Bit Mountain during St. Patrick’s banishment of Satan from the caves there. Standing at an incredible 300 feet (for a mere rock) and topped with medieval buildings, it is a stunning visual. The lengthy history of this great rock involves the King of Munster‘s baptism by St. Patrick in AD 450 (who legend has it was accidentally stabbed in the foot during the ceremony), the 1134 consecration of the bi-steepled Cormac’s Chapel (distinct for its Romanesque paintings, broken arches and a sarcophagus that historians used to believe contained the body of King Cormac himself) and the 1495 burning of Cashel Cathedral at the hands of the Earl of Kildare (who supposedly offered the following explanation to King Henry VII as to his reasons why: “I thought theArchbishop was in it”).